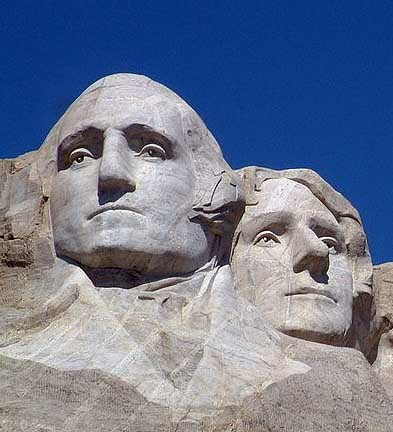 George Washington (L.) and Thomas Jefferson (R.) on Mount Rushmore. Early Americans had varying views on slavery, which would set the course for slavery to become a main point of contention for Americans by the time the Civil War erupted. For example, in the late 1700s, many Chesapeake farmers hired out their slaves to other farmers. Gordon Wood, Empire of Liberty, 511. This development led some to believe that slavery would eventually be replaced by wage labor. Sarah S. Hughes, “Slaves for Hire: The Allocation of Black Labor in Elizabeth City County, Virginia, 1782 to 1810,” WMQ, 35 (1978), 260-86. Consequently, some Americans believed that slavery was but a passing trend that would evolve and no confrontation would emerge on the issue. Both George Washington and Thomas Jefferson were slave owners, but each had their own view on the subject. George Washington saw that slaves “had no incentive to work hard and develop ‘a good name’ for themselves,” which he saw as slavery’s biggest flaw. Gordon Wood, Empire of Liberty, 513. This led to the question of what slaves could accomplish had they had opportunities for advancement in both reputation and respect, which was a subject Washington pondered. Robert F. Dalzell Jr. and Lee Baldwin Dalzell, George Washington’s Mount Vernon: At Home in Revolutionary America (New York, 1998), 129, 212-13. Jefferson, meanwhile, owned one of the largest plantations in Virginia at the time, holding around 200 slaves at any given time. While he infamously condemned slavery and yet maintained a plantation with slaves, he was known as a compassionate owner, comparatively speaking. He would prescribe lighter work for women, children, the elderly, and the sick. Gordon Wood, Empire of Liberty, 515. Nonetheless, his slaves would inevitably receive lashings for misbehavior. The fact that Jefferson could be viewed as a compassionate owner speaks volumes about the severity of slavery, where the most inhumane and cruelest treatment was viewed as normal. Finally, there were those who opposed slavery and spread an egalitarian message hoping to abolish slavery. Gordon Wood in Empire of Liberty theorizes that the spread of this message essentially forced slave owners who wished to preserve their livelihood to “fall back on the alleged racial deficiencies of blacks as a justification for an institution that hiterto they had taken for granted and had never before needed to justify.” Id. at 508. Thus, Wood concluded, “[t]he anti-slavery movement that arose out of the Revolution inadvertently produced racism in America.” Id. As we now know, the early Americans’ views would ultimately collide and culminate in the Civil War some decades later. Retrospectively, it seems that it would have been naive to expect slave owners like Jefferson and Washington to truly advocate for the cause of abolishing slavery. While they were part of the group of Americans who realized that slavery was ultimately a wrong that must be righted, their personal observations about and actions toward their own slaves seem to show their mentality being akin to “This is hindering the country and its people, but someone else in the future is going to have to solve it.” And so it happened that way. But it deserves mention that the early Republic was replete with significant, fundamental issues that would shape the future of the country, many of which have been minimized or forgotten compared to the issue of slavery. Thus, to squarely blame Jefferson and Washington for not ending slavery would be unfair. As to Wood’s conclusion that the anti-slavery movement ultimately created racism, this deserves a great deal of consideration and analysis. The first and most obvious question is: Wouldn’t racism always have been the slave owners’ justification? Whether it was the anti-slavery movement or some other external pressure, such as economic inefficiency of slavery, slave owners would have been forced to one day justify the existence of slavery. For the slave owners, it seems that the quickest defense would have been race. While Wood may not have intentionally implied that the anti-slavery movement was solely at fault for creating racism, most would take issue with that conclusion. Regardless, the massive issue of slavery, with its lengthy, disturbing history, was set on a new course in the earliest days of the Republic. While this course would result in the Civil War, it also would result in the abolishment of slavery. That is the result Jefferson wanted, the result Washington wanted, and the result that helped America to move forward.